On October 22-23, 2018, the European Chemical Agency (ECHA) hosted a workshop in Helsinki to discuss next steps towards developing a database for declaring information on SVHCs in articles. ECHA has just over a year left to develop the database. Manufacturers, importers, distributors, and retailers selling products in the EU may start submitting information on SVHCs in their products starting January 2020. The submission of SVHC in articles information becomes mandatory starting in January 2021. How to ensure that each duty holder has the information they need? How to get such information to the authorities? How to avoid overlaps in the notifications? How to display the data? Which learnings from existing supply chains (tools)? 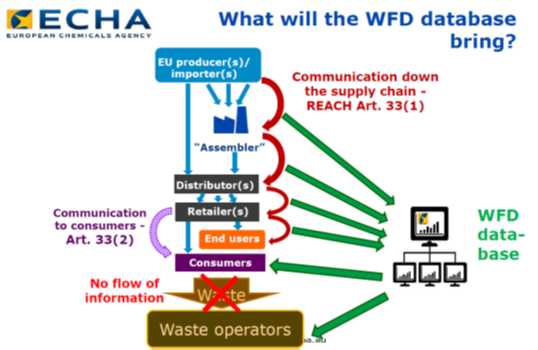 During their opening presentation, ECHA introduced their vision for the database and provided a summary of the feedback that they received to their request for input. Figure 1 illustrates ECHA’s thinking that suppliers throughout the supply chain will declare parts that contain SVHCs. These supplier declarations will then be used by downstream manufacturers to create their declarations. Industry has been trying to argue that this approach ignores several practical issues such as a global supplier chain, multi-vendor sourcing and confidentiality of suppliers. 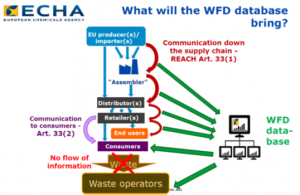 In response to the call for input, ECHA received a total of 116 submissions from industry (associations and individual companies), waste operators, NGOs, academia, IT tool providers, and public authorities covering 12 EU countries, Norway, US, Canada, Mexico and Japan. ECHA provided a very high-level summary of information that was submitted and avoided many of the critical comments that were made. The full ECHA presentation is available from the workshop website. A follow-up meeting to discuss the information to be submitted and the data format will be held during a material declaration standardization meeting in Genoa, Italy on November 19th. This entry was posted in nl2018q3 on November 16, 2018 by ECD_admin.